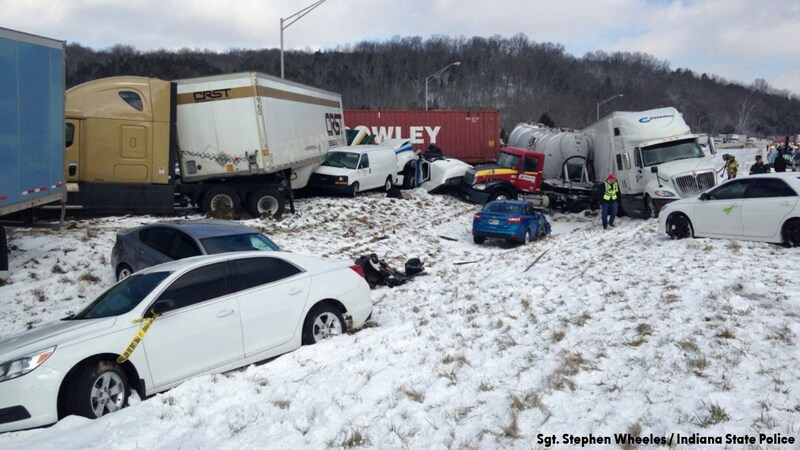 DEARBORN COUNTY, Indiana (WABC) -- Weather is believed to be the cause of a pile-up crash involving dozens of vehicles in the Midwest that shut down Interstate 74 Tuesday. The crash happened in Dearborn County, Indiana, close to the Ohio state line. Sgt. Stephen Wheeles with the Indiana State Police said there were two separate crashed that totaled 40 different vehicles. The crash scene was a half-mile long. Many of the vehicles involved were tractor trailers. That part of the country was hit by two rounds of snowstorms Tuesday morning, causing slick roads and poor visibility. WCPO-TV reports there were some serious injuries in the crash.